The primary reason for collecting original artwork is simple: you love owning beautiful things and you want to surround yourself with them. Art collecting is about passion and emotion, and it's about finding art that captures something inside you and brings you back to gaze at the painting over and over again. Art collecting is a game, a lifelong pursuit of discovering what your tastes are and finding art that represents the way you view the world. Art can be a reminder of places you've traveled, cultures you've become immersed in, a style you've fallen in love with, or art can simply be about beauty captured upon a canvas. Original artwork holds a magic not seen in two-dimensional prints. You are owning something that was created by an individual artist's hand and mind, transforming a blank canvas and simple pigments and materials into a completely new, one-of-a-kind creation. With an original oil painting, the thick texture adds a three-dimensional depth to the piece, drawing you into the pattern and movement of the individual brush strokes in a way that a photographic print cannot capture. You definitely know you are looking at an original when you see a thickly-textured painting! Another fun benefit of owning originals is watching them change color throughout the day. If you've ever lain in bed watching the dawning light change over an oil painting, you'll know what I mean. The painting becomes warmer or cooler depending on the surrounding light, and the semi-translucent nature of the oil paint catches the light and seems to glow from within. Owning a fine creation that is truly one-of-a-kind, and surrounding yourself with artwork that represents your tastes and sense of beauty, is all the reason you need for collecting originals. 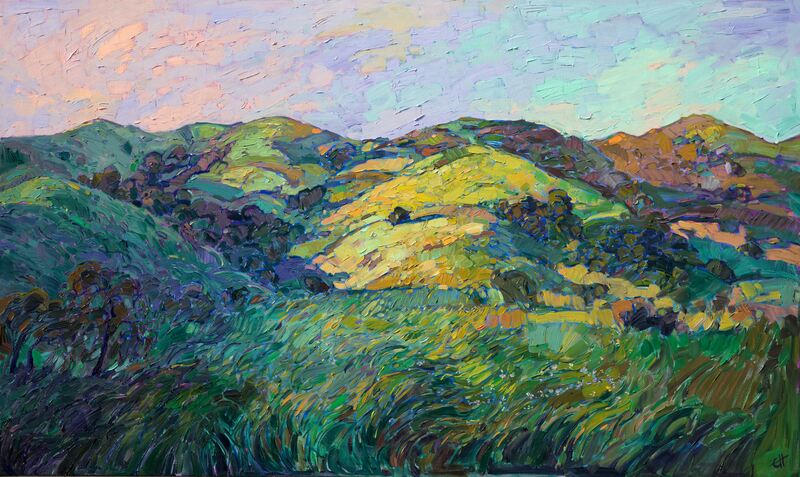 If you are a fan of impressionism, you will love discovering the works of Erin Hanson. Her modern impressionist style, a blend of expressionism and impressionism, with a dash of plein-air style, has captured the imagination of art collectors around the world. Her new technique of painting in oils, created during a lifetime of applying her unique vision to the canvas, has become known as "Open Impressionism." With millions of views of her painting images online every month, over a hundred thousand followers on social media, and her work being taught in hundreds of art schools around the world, Erin has inspired a whole new wave of artists, both young and old, to follow their passion and become painters as well. 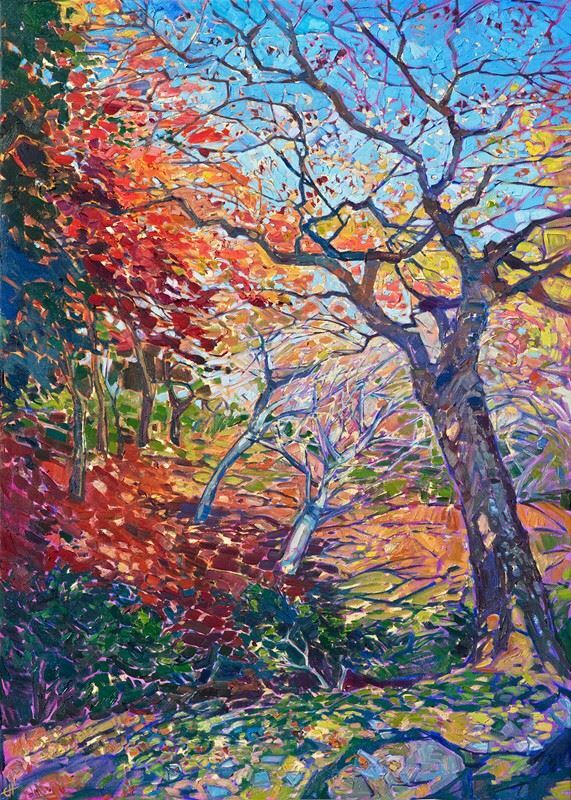 Erin Hanson began painting in oils when she was 7 years old, and she spent her younger years experimenting with different media and subject matter. 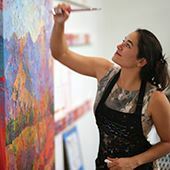 As a teenager, she worked in a mural studio, creating custom 40-foot murals for casinos and restaurants around the U.S. After getting her degree in Bioengineering from UC Berkeley, Erin moved to Las Vegas and began rock climbing at Red Rock Canyon. 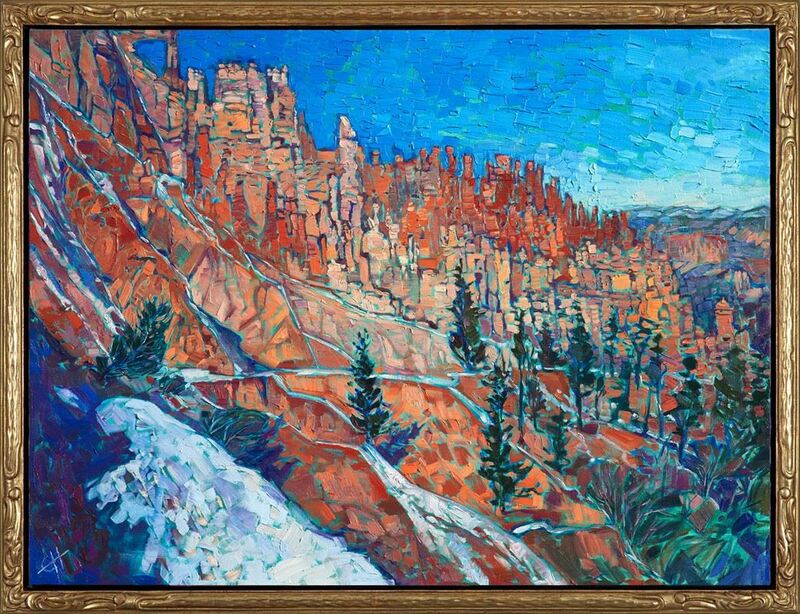 This exposure to the beautiful red rock scenery of Nevada and southern Utah inspired her to start painting landscapes again. She decided to create one painting every week, to keep herself continually improving as an artist, and to see where her art took her. Twelve years later, Erin now runs her own gallery in San Diego, and she travels around the U.S. exploring beautiful landscapes and capturing light with her brush and canvas. Her unique style of painting is recognizable on sight, her pure colors and thick brush strokes unlike any other's. She creates her paintings using a limited palette of only 5 colors, and she lays her brush strokes side by side, without layering, attempting to capture the scenery in a spontaneous manner that captures a true impression of the landscapes she loves. She wants her artwork to communicate the joy she feels while outside hiking or backpacking or just exploring the open countryside. The purpose of a frame is to focus attention on your original artwork, complementing your painting without distracting from it too much. The style of the frame also makes a statement about the piece of art - for example a plein air painting, when hung in a traditional gold plein air frame with hand-carved edge embellishments, says to the viewer "I was painted on location by a plein air artist." A contemporary piece of art might be best set off with a simple floater frame, while a traditional impressionist painting might work best in a carved and gilded frame. 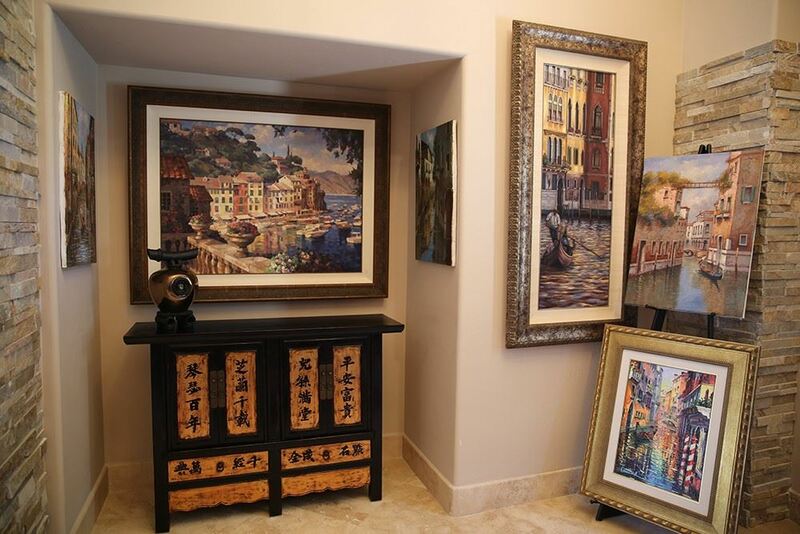 When interviewing art collectors, we have found a variety of tastes when it comes to framing. Some collectors like their originals hung unframed, the deep sides of the canvas acting to separate the painting from the surrounding room. Some art collectors like wooden frames that match the wooden tones of the furniture in the room. Some collectors prefer to leave the choice of frame entirely up to the artist. When you buy an Erin Hanson painting, we offer several options for framing. Paintings under 20" (petite paintings) are offered in a variety of traditional frames, either gold, dark wood, or black-and-gold. Paintings over 20" are created on 1-1/2" gallery-deep canvas, with the sides of the painting finished as a continuation of the painting. (This allows you to hang the painting unframed if you wish.) These larger paintings are offered in custom, hand-made floater frames, which are hand-gilded in 23-kt gold leaf. 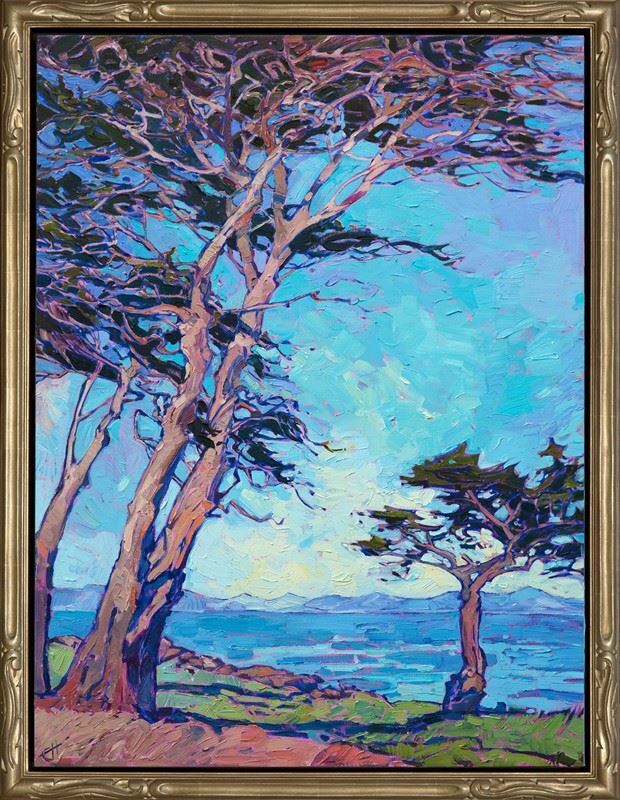 Our Open Impressionism frames, which are hand-carved with embellishments on the corners, were designed by Erin Hanson herself, and they are a blend of classic impressionist frames and contemporary floater frames, just as her painting style is a blend of the classic and contemporary. 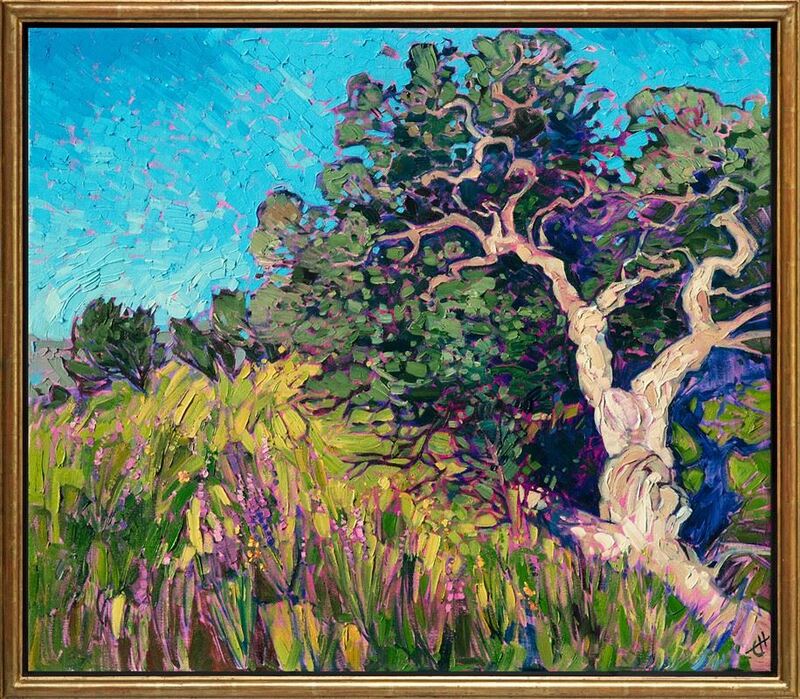 above: the "curved EH frame"
You are welcome to visit Erin Hanson's gallery and art studio here in San Diego, located off Miramar Road in central San Diego. It is always wonderful to be able to see original artwork in person before you decide which piece you want to add to your collection. San Diego is a great city to vacation in for a few days, so you can make a weekend out of it! We understand not everyone will be able to travel, so we make it easy to buy paintings online or by calling the gallery. We can email you high-resolution photos of the paintings in their frames, and we can create a digital mock-up of the painting in your room if you like. We guarantee all our works, so if you receive the painting and you don't absolutely love it, we will take care of the return shipping, and we will apply the amount paid towards another painting. We also offer white-glove installation services and assistance with lighting. 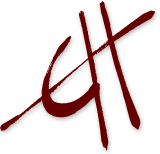 Take a look at our testimonials page from collectors who have purchased paintings online and in person.